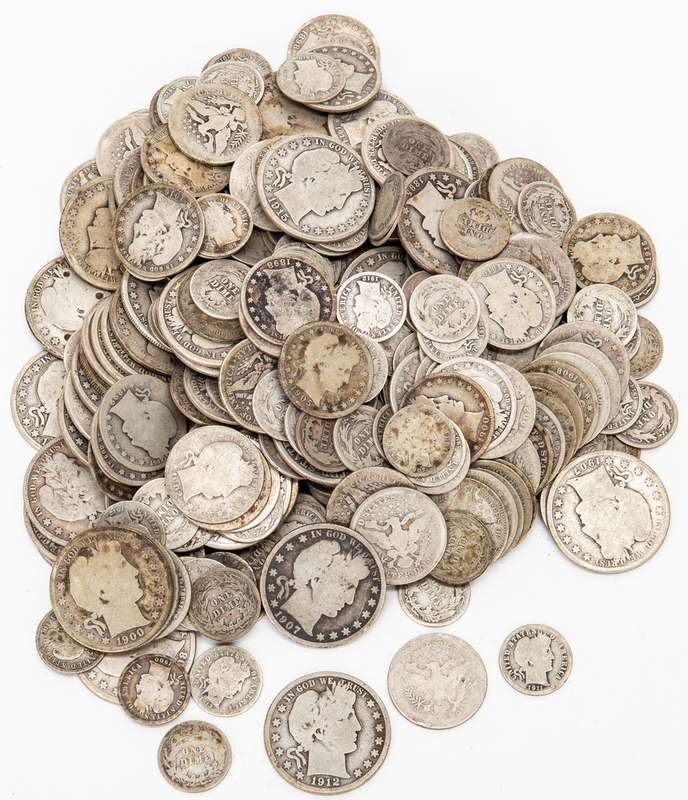 Three hundred and four (304) Barber Silver Half Dollars, Quarters, and Dimes. 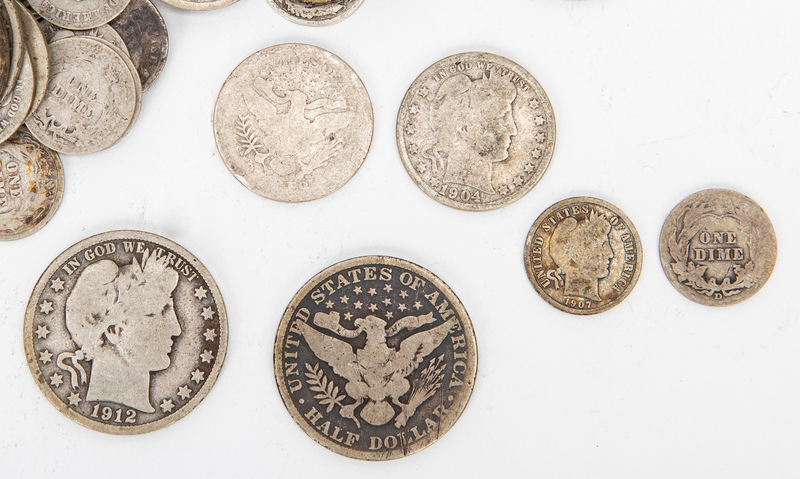 1st-52nd items: Fifty-two (52) Barber Half Dollars, including one (1) 1893, one (1) 1895, one (1) 1897, two (2) 1899, two (2) 1900, two (2) 1901, two (2) 1902, four (4) 1903, two (2) 1904, three (3) 1906, eight (8) 1907, ten (10) 1908, six (6) 1909, one (1) 1910, three (3) 1911, two (2) 1912, and two (2) 1915. 19.35 total troy ounces. 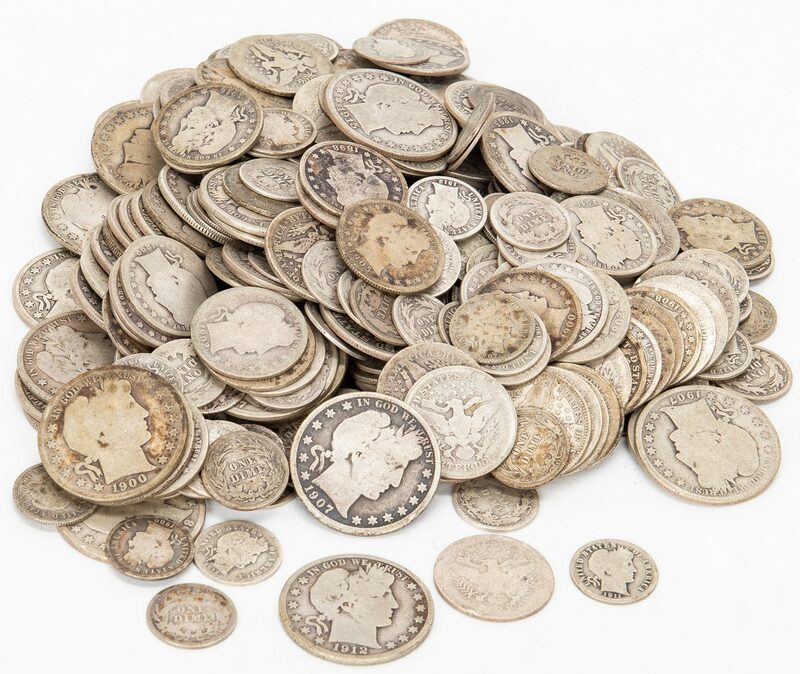 53rd-125th items: Seventy-three (73) Barber Quarters, including two (2) 1892, one (1) 1895, one (1) 1896, three (3) 1897, four (4) 1898, seven (7) 1899, one (1) 1900, seven (7) 1902, two (2) 1903, four (4) 1904, one (1) 1905, four (4) 1907, six (6) 1908, seven (7) 1909, three (3) 1911, one (1) 1912, one (1) 1913, nine (9) 1914, three (3) 1915, and five (5) 1916. 13.23 total troy ounces. 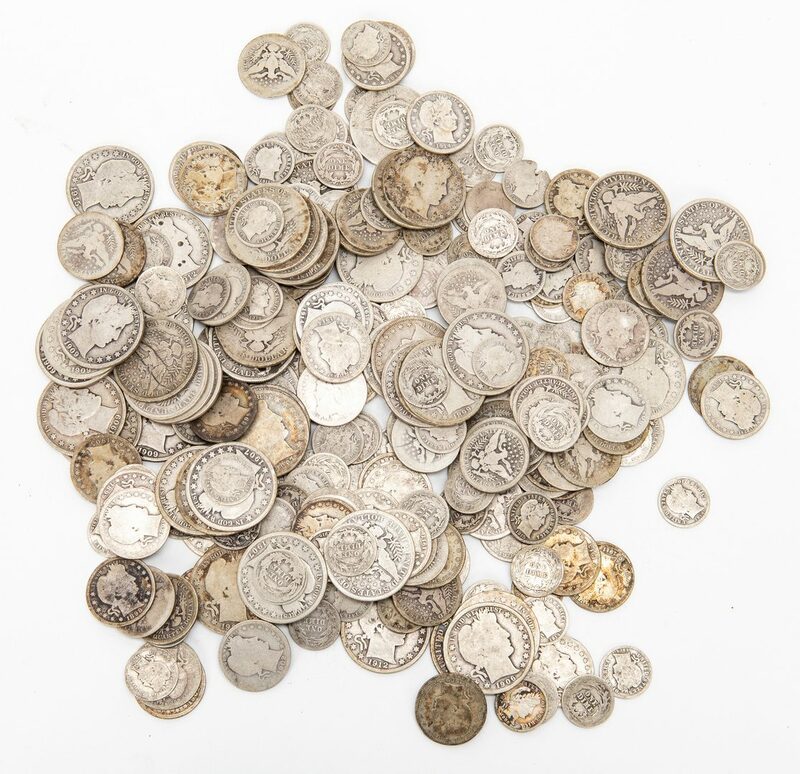 126th-304th items: One hundred seventy-nine (179) Barber Dimes, including one (1) 1893, one (1) 1897, two (2) 1898, four (4) 1899, two (2) 1900, two (2) 1901, nine (9) 1902, eight (8) 1903, four (4) 1904, two (2) 1905, eight (8) 1906, twelve (12) 1907, eight (8) 1908, seven (7) 1909, six (6) 1910, nineteen (19) 1911, twenty-four (24) 1912, eleven (11) 1913, twenty (20) 1914, nine (9) 1915, twelve (12) 1916, and eight (8) illegible, 12.93 total troy ounces. 45.51 total ounces troy for all coins. Provenance: the collection of Benjamin Dysart, Brentwood, Tennessee. CONDITION: Circulated condition.